I know, today you can buy turmeric powder at every corner. It’s also cheaper to buy prepared powder than to make your own. 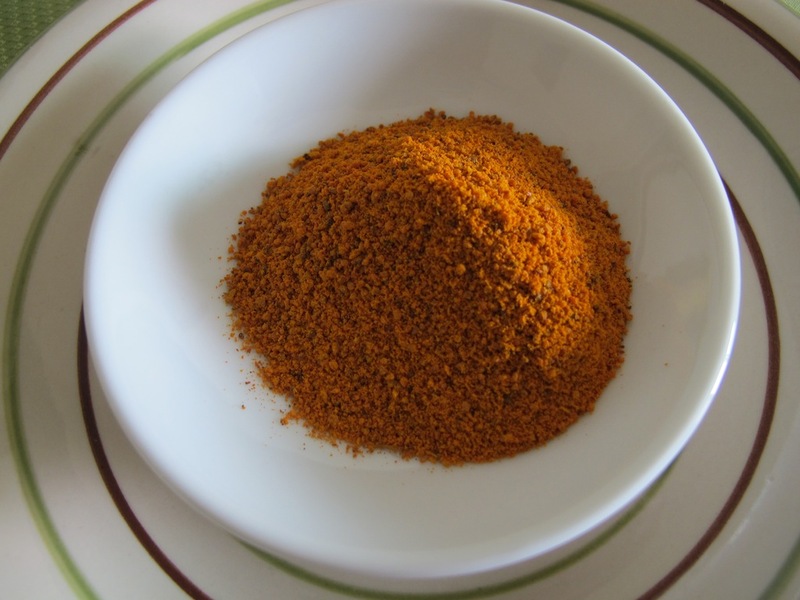 The magic with homemade turmeric powder is the same as with everything homemade. It tastes better, fresher, deeper and more fragrant. 1. Buy turmeric roots, bring home and wash under running water. 2. Bring water to boil in a saucepan, add turmeric root and cook it for 40 minutes. Cool the root down and peel the outside skin (potato peeler will do). At this point you should wear rubber glows since turmeric has high yellow color content. If you don’t use rubber gloves your hands will stay yellow for few days:-). 3. Slice the root into long pieces – approximately 5 cm each. 4. Dry turmeric root. Let it rest for a day, or overnight, on a paper kitchen towel (change it once). And then put it on a plate and place it in a cold, ventilated location for few days (5-7 days). Don’t put it in direct sunlight (it will make color fade). We put ours in a cold oven and left the door ajar. Stir it once a day, or every two days. 5. It’s time to make a powder. We use mortar to break it down in smaller pieces, and than we use nut grinder to make powder. It’s a long process, since it’s hard to grind dry turmeric root (the nut grinder can get overheated). But take it slowly, grind, then do something else, then grind again. It will never have the texture like the one bought in store, but the taste will be superior in so many ways. 6. Store it in a glass canister with tight lid, it can stay like that for two years. Health benefits of turmeric powder…It can be use as a fat-burning element and digestion aid, cancer-risk reduction, and Alzheimer’s disease remedy among others. It is also used as an ingredient in beauty products. This site has all the lovely details WHfoods.org, which I’m to lazy to transcribe! Is it really important to boil the Turmeric first? I peeled the fresh roots and ground them, now they are drying! Is this a good way to go? bdw. The boiling process is called curing. Curing the root makes it softer and easier to grind as well as enhances the flavour and color. next time you can try it with boiling process and compare the results. Thank you. I just harvested my turmeric and I’m very excited to make my turmeric powder. any brand of spice grinder or coffee grinder. just be patient and grind small amount of turmeric one batch at the time. turmeric is very hard when it’s dry so grind for 30 sec and then let your spice grinder rest for a while, repeat the proces until the result is satisfactory. how about the boiled water of turmeric root. can we use this turmeric in face packs for skin lightening?????????????? no way! your skin will turn yellow. YELLOW! I found plastic pieces from my spice grinder in the first batch and so I tried using a small blender….then 2 blades of another blender broke as well, so I am afraid to try using my vitamix. how was your experience with the vitamix? ops. I’m not sure, but it seems like vitamix is not for this job. do you have old fashion coffee grinder? My mum used to do this all the time. She lived in Uganda and there was a lot of fresh turmeric available. She use to peel, boil then grind in a food processor. Dry in the intense Ugandan heat and then pound in a pestle and mortar. All us siblings got jars of the stuff. Miss her wisdom. you have already boiled it, therefore it was extracted…is the smell of the turmeric still strong when it was pulverized now? hello, where can i buy turmeric in manila? by the way, do you have a facebook page for your tips? Will it be okay or healthy to use the oven/microwave instead? Rather than store it in day light instead? sure, you can use both!